Steve Harding, Chairman of Rabobank N.A. 's Community Leadership Group, presents a $7,500 grant check to Peoples’ Self-Help Housing President/CEO John Fowler during an educational summer class at Courtland Street Apartment in Arroyo Grande. The grant is in support of the Youth Education Enhancement Program. 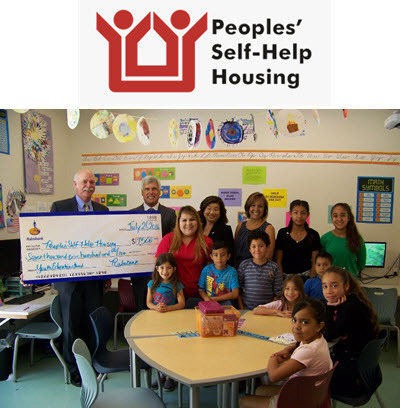 Central Coast, July 25, 2016 – Rabobank has presented Peoples’ Self-Help Housing (PSHH) with a $7,500 grant in support of the nonprofit’s Youth Education Enhancement Program (YEEP), focusing on improving the literacy, English and math skills of student residents. Rabobank regularly supports nonprofit organizations with missions to provide affordable housing and programs to low- and moderate-income individuals, among other causes. This gift will support PSHH’s YEEP program, which offers educational support to K-8th grade students at nine PSHH housing sites. In 2015, the program and its dedicated educators helped nearly 300 students improve math, language arts and other essential skills.